The city of El Paso, Illinois is one that we at BN Realty have been anxious to talk about to our readers. Located about 20 miles from Bloomington-Normal, El Paso can be reached by taking I-39 northbound towards Minonk. According to the 2010 Census, the population was 2,810, the majority of the homeowners were married couples and 35.9% of the homes had children under the age of 18 residing in the home. This means the schools in El Paso are highly important to its residents. The mission of the El Paso – Gridley Community Unit School District #11 is to build student success by empowering the youth of today with the knowledge to become responsible adults of tomorrow. The schools in this district are: Gridley Grade School Jefferson Park, Centennial School, El Paso Gridley Junior High, and El Paso Gridley High School. The real estate market in El Paso has several homes for sale in addition to numerous lots to be developed. With the lots ranging from about ½ acre all the way up to 5 acres, there is a wide variety of what type of home can be built. There are equally as many options when it comes to home listings in El Paso. The value that can be found here is second to none, and we highly recommend that you take a ride with one of our realtors to this small town to see exactly what we mean. For under $100,000 there are great options for family homes with plenty of room for everyone. If your budget is a little bit higher than that, consider one of the larger homes in the area, with some even close to 4,000 square feet for just north of $200,000! One of the staples of El Paso is its golf course! 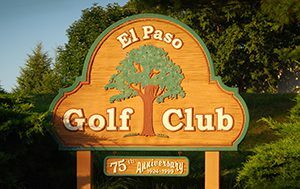 The El Paso Golf Club is located at 2869 County Road 600 North. They can be reached at (309) 527-5225 or golfclub@fairpoint.net. This country club is a scenic, well maintained, challenging test of golf that has a USGA rating of 69.6 and slop of 126. The gold club features elevation changes, 40 sand traps, 400 trees, three lakes and a creek. If golf isn’t the sport for you, keep in mind that the El Paso Golf Club also has a bar and restaurant and hosts many events in their banquet area throughout the year. Any of our excellent real estate agents would be more than happy to sit down and talk about the benefits of living in a city like El Paso. It would be our pleasure to expand your home search to this area and others just like it. Call us right away to set up an appointment 309-319-6030!